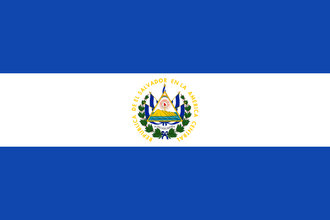 El Salvador is a small nation in Central America. It is bordered by Honduras to the north and Guatemala to the west. Its two provinces are hills. El Salvador, lacking a unique national focus tree, uses the generic national focus tree instead. El Salvador starts with 2 research slots. El Salvador, in 1936 is a Fascist nation with elections every 4 years and the next one being at January 1939. El Salvador is guaranteed by the United States via Monroe Doctrine. El Salvador may form the United States of Central America if it controls all other independent Central American countries excluding Panama. Doing so will give it cores on the required territories plus British Mexico (311). El Salvador has 2 Civilian Factories and 1 Military Factory in the state of El Salvador. It has 1 more building slot. El Salvador has 1 Chromium. El Salvador has a small military. Even though the country is small, the industry is tiny the manpower is tiny and it has basically no resources. It does have neighbors that are similar in strength to itself. That, and you have the possibility to form the Central American union. But even this union will only give you about the same manpower as the Netherlands, Hungary or Belgium has, with about the same industry. But without the resources and the options to expand. First thing you need to do, is increase your military production. Choose for the focuses that give you extra military factories. After 2, go for the research slots. With the first PP, justify on Honduras, and the country to the west directly after this. Depending on historical focuses on or off, you have to deal with the USA after a few attacks, as they want to stop you. Amass about 12 armies (of 3 each) for the first target, and about 16 for the second one. Aim directly for the capital. After these 2, on nonhistorical focuses, the USA usually interferes. And you either have to make countries you want to invade fascist, or go for a 1 week war maximum. This can only be done having air supremacy, so don't forget about these. After your first 2 targets, it is quite easy to conquer the rest of them. Keep an eye on your manpower, as it will go very low quickly. Before declaring on Costa Rica, decide what you want to do. You don't have many options from here on out. You have to either go to make Mexico fascist, to then conquer them. Research naval invasions and marines and build boats and go for Venezuela. Or join the Axis and try to kick out the allies from southern America. Have a good strategy for El Salvador?